Full port split body design, blowout proof stem, anti static device standard on all valves. Self adjusting floating ball. Fire safe design in compliance with API 607 and BS 6755. Patented Stem double sealing design provides a high cycle automatically adjusting stem seal. The spherical segment ring at the bottom of the stem, energized with Belleville washers provides constant pressure to the primary stem seal forcing it outward and upward against the bottom of the stem journal. All of the media will be contained by this seal under most conditions. A top journal set of three v-ring chevron packing acts as a secondary seal promoting a high cycle, self adjusting stem seal. 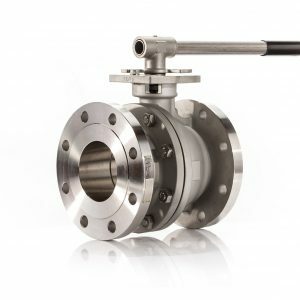 The Triad series 9150 is also available with a V-notch ball option for control valve options and metal seats for high temperature and abrasive applications.